When it comes to email marketing, content is critical, but design is just as important. A well-crafted email can generate more clicks and conversions, lead to more customers, and avoid those pesky spam filters. Unfortunately, great email design is relatively rare, but there are some simple steps for making email marketing campaigns much more effective and engaging. With email marketing gaining even greater momentum for 2013, SwiftPageConnect.com offered their top tips for designing emails that look good and lead to great results. The first step in email design is proper planning. 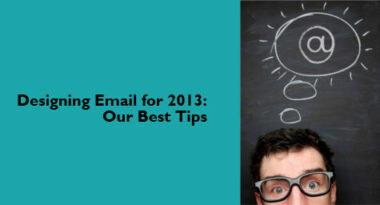 First consider the goals of the email campaign and the kind of content the emails will include. By taking the time to outline the objectives, the layout will become much simpler to structure. The email needs to reflect the tone of the business and its branding, so take the time to match the colors, fonts, logos, and language being used on other marketing materials to ensure consistency and brand recognition. Also, avoid pasting text straight from Word since it can negatively affect the email design and code. Design emails to be no larger than 600 pixels wide and stay away from Web-type navigation since it doesn’t work well when viewed on mobile devices. Choose images that tell a story to enhance the value and retention of the message. Then, position them on the left side and place text on the right since images generally direct the reader’s eye to the text. Since many recipients turn off images on their computer settings, design the email with the assumption that images will not be seen, so make the text speak for itself. Make headlines compelling and concise and feature them throughout the content since they draw the eye to the text. Keep the text to approximately three lines per paragraph since it eases scanning and is more mobile friendly. Also, use fonts below 24 pixels because huge fonts can take up too much of the layout and come across as shouting. Highlight calls-to-action (CTAs) in bolder and larger fonts at least 44 pixels square to be viewable to mobile readers. Don’t underestimate the power of white space since it will allow the eye to rest and make CTAs more prominent. If the images chosen include faces, aim to have their gazes pointed at the CTA because it will steer the reader’s eye to this critical element. First, get some outside opinions about the email before it is sent and use that feedback to optimize its design. Then, optimize it even more by testing the email on a few clients and on mobile devices. Finally, double-check all links to make sure they take readers to the desired Web pages. With the constant flood of emails filling inboxes today, it’s essential to design emails to be as attention grabbing as possible. Use these tried-and-trusted tips to maximize the impact of an email marketing campaign, then watch the clicks and conversions come in. To implement an effective email marketing campaign, contact MDG Advertising. At MDG, a full-service advertising and digital marketing agency with offices in Boca Raton, FL and New York, NY, our 360° marketing approach uses just the right mix of traditional and online media to reach your marketing goals. While some industries may fare better in print and others online, we strive to create a balanced approach where traditional and digital marketing efforts support each other and your message is tailored to the medium. To stay on top of the latest email marketing trends that will make an impact for your business, contact MDG Advertising.